Staglers 100% Natural Dog Chew – Medium. Sold individually. One of our most popular chews. Ideal for smaller breeds who just love toys and chews. 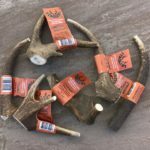 Deer Antler Dog Chews – It has to be Staglers! Guaranteed, premium quality antler which is naturally shed, from wild Red deer, annually. This is a totally natural, unprocessed product, clean, nutritious, long-lasting and a great treat for all dogs. We love the fact that they are recommended by vets too! Instinctively loved by dogs and long term value for money for owners, everyone is a winner with these superb chews. 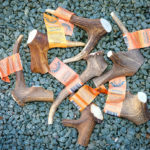 Staglers 100% Natural Deer Antler Dog Chew – Medium Sold individually. Our medium dog chews are one of the most popular. The benefits to your dog’s well-being, both emotionally and physically are one of the most exciting features of these natural chews. One of the trade customers we supply is an important vet in the world of canine care and they recommend, and supply, to their clients. They totally understand the power of Stagler’s teeth cleaning properties and resulting well-being. Oh and the happiness, and contentment, your pet has when doing what comes naturally, chewing. A Stagler rather than furniture, shoes or paper for puppies is perfect. The natural cleaning process gives you a totally natural, unprocessed product, clean, nutritious, long-lasting and a great treat for all dogs. Which Size / breeds of Dogs love medium Dog Chews? We love the Good Housekeeping small breed photos!. Fat Free and suitable for dogs on diets. No stains on your carpet, great news! Your dog will most likely have a good chew with one of these, leave it, then come back to it again and again. Some customers give as a treat after mealtimes, others give as a comforter. Each spring male deer they lose their antlers, after mating, which will then start growing again, year on year. Our antlers are collected from free ranging deer in southern Europe, brushed, hand cut and graded on weight. Because antler is a purely natural product they all differ in colour, weight, shape and thickness. We guarantee we only buy the Top Grade A, premium quality antler we do not buy lower grade, white antlers, as these do not last long and can splinter. Customer feedback says long-lasting, top quality, safe and gives satisfaction. The sustainable future of dog chews in years to come! To avoid a choking risk take the Stagler away from your dog once it gets worn down to a small enough size that your dog could easily swallow. Always supervise your dog when chewing. We recommend you monitor use and when all is “chewed and done” you should remove the small piece to prevent swallowing. As recommended by vets too!